Brothers and sisters in Christ, grace and peace to you from God our Father and our savior Jesus the Christ. Amen. I spent about 34 hours this week on the ground in the Phoenix/Mesa area. We hosted three gatherings on Wednesday with snowbirds from Good Shepherd who are living in this area for the winter. Although it is always an incredibly quick trip, it is one that I am grateful for and hope to be able to continue to do in the years to come. And from the 2 dozen or so brothers and sisters in Christ from Good Shepherd that I had the pleasure of spending a little time with this week in Arizona, I bring greetings to you today. And without hesitation, they informed me that if it’s still snowing in North Dakota – they’ll keep enjoying the desert sunshine. They’ll see us again sometime in the spring. Which seems like a long way away on a snowy day like today. And as you can see by my lack of hair today, Brave the Shave was a wonderful success. The team I was part of, led by Dr. Tim Pansegrau, is currently in second place having already raised nearly $50,000. Our collective efforts have resulted in me finding myself in second place currently with nearly $9,000 raised as well as claiming first place for most donors toward those efforts. You can still go to the Brave the Shave website and give to Pansey’s Peeps or my individual page until the end of the month. Thank you for your prayer, your financial support, and your sense of humor through all of this. We were so successful that losing my hair for a few weeks might just become an annual event – especially if it can help kids with cancer. Brave the Shave is an amazing community event that shows just how much light we can shine into the darkness of our world when we work together. Light that needs to shine into dark places for kids who have to walk the evil journey that cancer is. The Bible is filled with stories of light and darkness. Abram had no idea where he was going, but God called him to go. And at the young age of 75, Abram went. Out of darkness, light shined forth in order for Abram to be a blessing to all nations (Gen. 12:2). Prior to being called the Apostle Paul, he was known as Saul – a ruthless murderer and persecutor of Christians. Out of that darkness, Saul experienced the light of Christ on a desolate road. His life was changed forever and his calling was no longer about the darkness of persecution and murder, but proclaiming the light of Christ to anyone he could. Our gospel reading today is from the gospel of Saint John. A major theme throughout John’s gospel is light and darkness. Night or darkness symbolizing unbelief. Day or light symbolizing belief. One of my favorite stories of this darkness and light in John’s gospel is the one we just heard with a man named Nicodemus – a powerful leader of the Pharisees. He comes to Jesus at night. The questions that Nicodemus has for Jesus are fascinating. He is trying to step into the light of who Jesus is – light that will shine with belief. But he is struggling within the powerful grasp of darkness because of unbelief. As I hope you know by now, it’s Lent, time for a little confession…one of my favorite movies of all time is Mary Poppins. I’m not sure why, but I just love that movie. One of the commentaries I read this week reminded me of that in a most beautiful way. There is a scene in Mary Poppins where Mary, Bert, and the kids jump into the middle of a sidewalk chalk drawing. They leave a world that is somewhat dark, grey skies and simple clothing. After they jump, the world is entirely new and much more colorful in every way! I was baptized as an infant at St. Mary’s Catholic Church right here in Bismarck, but I don’t think I had the courage to jump until I was in my mid-20’s. I knew that I was God’s child before my mid-20’s. I knew that in baptism I was claimed as God’s child forever. I didn’t have some supernatural out of body experience in my 20’s or finally say a magic prayer that would give God my contact information so I could begin to be loved by Jesus. 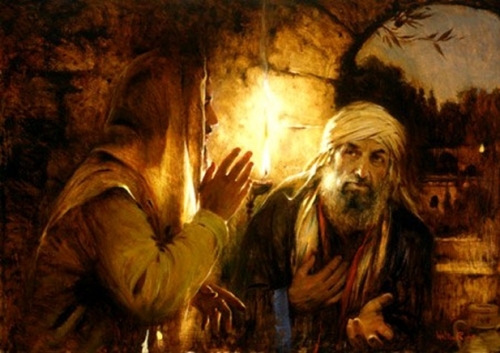 “You must be born again.” Jesus tells Nicodemus. Here’s a few ideas for what I think that might look like. When you give up your own will and follow the will of God, you are made new – born again. Instead of having control, you give up power – born again. Instead of knowing your destination, you are faithful during the journey – born again. Instead of being sure of yourself, you become sure of God’s presence in you life – born again. When Mary Poppins and the others jump through the sidewalk chalk drawing, they take on the colors of their new world. They are born again in a world that touches their old world and yet is wondrously different. In that new world there is space not just for work, but for wonder; not just for darkness, but for light. When I finally jumped into a new world like that in my 20’s, everything changed. Before that, just like Nicodemus, I was meeting Jesus in the darkness looking for the correct answer. Looking for the four quick and easy steps to be the best Christian I could possibly be kind of answers. Just like Nicodemus, I needed to see that if I wanted to follow this Jesus – the world around me and the way I thought about the world around me and the way I lived in the world around me, needed to change. Abram was 75 when this happened. The apostle Paul was blinded before it happened. By the end of the gospel of John, I believe that Nicodemus moved from darkness to light to become a disciple of Jesus in every way. If God is truly gracious and merciful, I pray that these ancient stories of God’s children moving from darkness to light will move each of us as well. That movement from darkness to light has caused me to experience the evil of childhood cancer in new ways over the past few weeks. Ways that caused me to jump and lose a little hair temporarily in the process. As you jump into the light with Abram, Paul, Nicodemus, and even Mary Poppins during your Lenten journey this year, may Jesus’ closing words in today’s gospel shine brightly upon your path. This week, let’s jump like we’ve never jumped before. Amen. This entry was posted on Thursday, March 16th, 2017 at 1:14 am	and posted in Recent Sermons. You can follow any responses to this entry through the RSS 2.0 feed.